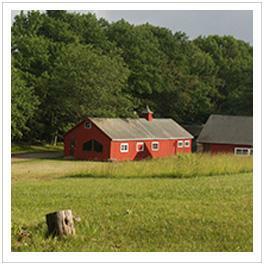 HVC's classic red restored farmhouse and attached barn, animal corrals and unique modern building, all create a welcoming, home-like atmosphere. Our heated dining hall features ample dining areas for campers and state-of-the-art cooking facilities. 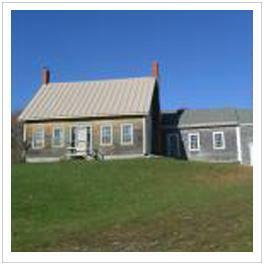 Over 15 Arts and Crafts facilities provide the basis for a range of artistic pursuits. Our Rec Hall, along with a recording studio and three dance studios, provides a range of creative and performing arts opportunities. 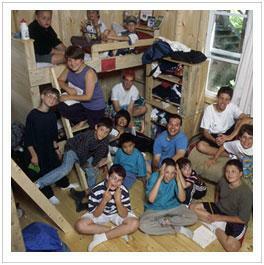 Many comfortable spaces all over camp for classes and camper groups to congregate cozily and productively. All the land around the spring-fed lake is privately owned, so there are no motor boats or public access. At the lake is our sparkling new pavilion, sauna, and waterslide. Trained staff provide supervision and instruction from floating docks attached to the shore. HVC's solar heated pool is over 75 feet long and provides the setting for recreational swims and lessons. A trail through the woods leads to the top of Ledge Mountain - a grass and pine tree-covered hill which provides a spectacular view of the lake and surrounding area - and the inspirational log cabin, built by campers in 1973, overlooking the lake. Hidden Valley's Ropes Course, one of the first of it's kind, was re-built in 2007, providing new challenges for campers. Hidden Valley's cabins are not dorms but rather open, airy, fun places designed for our unique camper groups. Campers are grouped by age or grade in any of these 24 modern structures. Every cabin has hot and cold water and all plumbing facilities. Click here to learn more. Peter and Meg meet regularly with counselors (3-4 staff per cabin) to monitor the progress of their cabin groups. 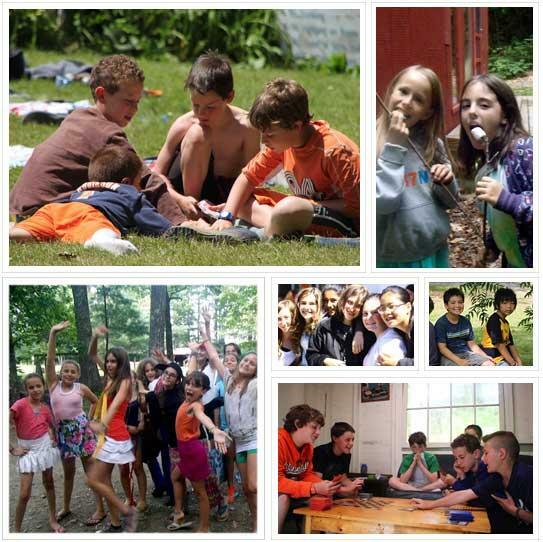 Hidden Valley owns all of its camp facilities. We do not lease the site. Camp Directors, Peter and Meg Kassen, live right in the center of camp; they keep an eye on all aspects of the facility. Year-round skilled maintenance crew makes sure that HVC is ready for camper arrival in June. 70 buildings include modern cabin facilities designed to support group development and camper comfort. Modern dining hall supports state-of-the-art menu for all dietary needs, and amazing food choices. 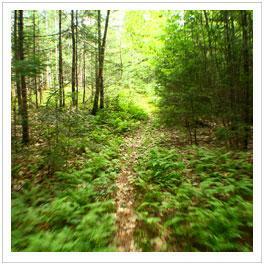 We're committed to minimizing our impact on the natural setting we steward. Find out more about our sustainability efforts here. Having had the chance to immerse ourselves in the camp, we discovered a peacefulness there, a calm and contentment that shows itself in the way the campers walk and speak... Erica greeted us with an easy-going, gentle pace which echoed in her voice. There was a richness in her... I think a huge part of the feeling emanating from her was [a result of] the environment and facilities at Hidden Valley; it is clearly one of the most beautiful and well-kept properties I have ever seen. I just wish other "first time parents" could know in advance just how caring and responsible you folks are. The new horse barn with stalls and privately leased horses, is fantastic, and the horses are cared for as if they were campers. The Blodgett House... Our hidden off-the-grid gem where Teddy Roosevelt once stayed. 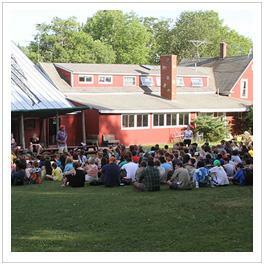 The barn originally served as the dining hall and camper housing. Now, it's program and recreational space. 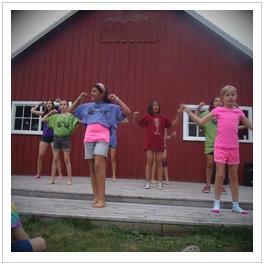 One of our many performance spaces around camp. A view of some of the performing and visual arts facilities, as seen from Tipi hill. I love all the creative and artistic touches, plus the whimsy of your signs and building names. I smiled and laughed a lot as I walked around, encountering that creativity at every turn.